Usually I determine what communities to explore for California Fool’s Gold based upon results of a poll (vote for Los Angeles Neighborhoods here, Los Angeles County communities here, and Orange County communities here). However, I explored the small neighborhood of Franklin Hills in August of 2014 not based upon the vox populi but in preparation for an art show of my maps which I called, Taste of the Mideast Side. At the time I filed away the memories of my ramble through Franklin Hills deep in the recesses of my positronic neural network and forgot about them until the wee hours of New Year’s Day, when they were reawakened by a discussion with someone who’d recently moved to Franklin Hills from Detroit. Now, four months later, I’m trying to give Franklin Hills the proper California Fool’s Gold treatment. What and where is/are Franklin Hills? 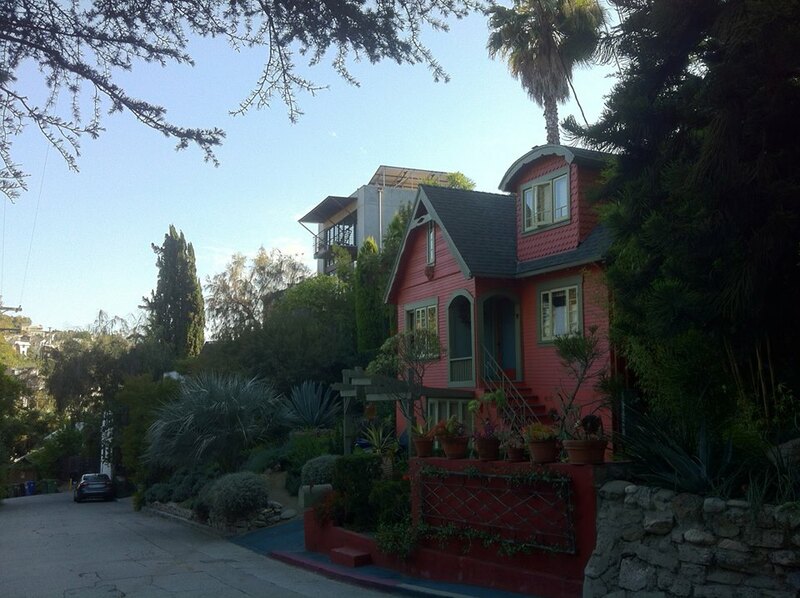 Unless you regularly spend time in Los Angeles’s Mideast Side, you’ve probably never heard of the neighborhood. 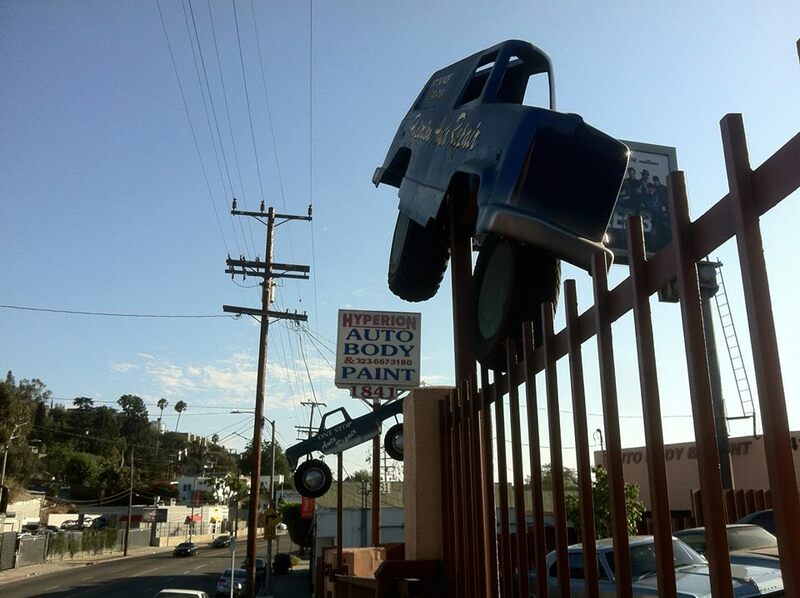 If you live in Los Feliz or Silver Lake, you’ve hopefully noticed the blue, LADOT neighborhood signs but likely never heard it discussed in conversation or seen it on any map. 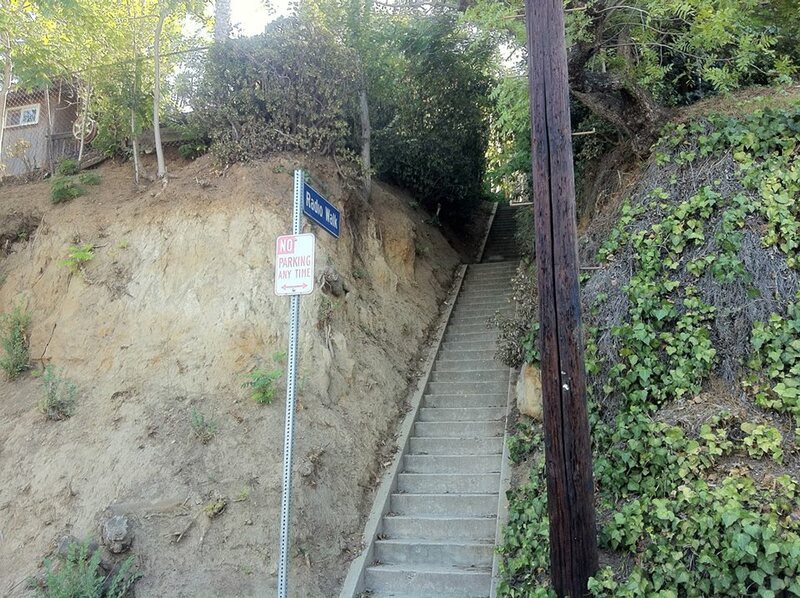 If you are familiar with Franklin Hills then it’s probably because you either live there or have visited it to climb its public stairways. 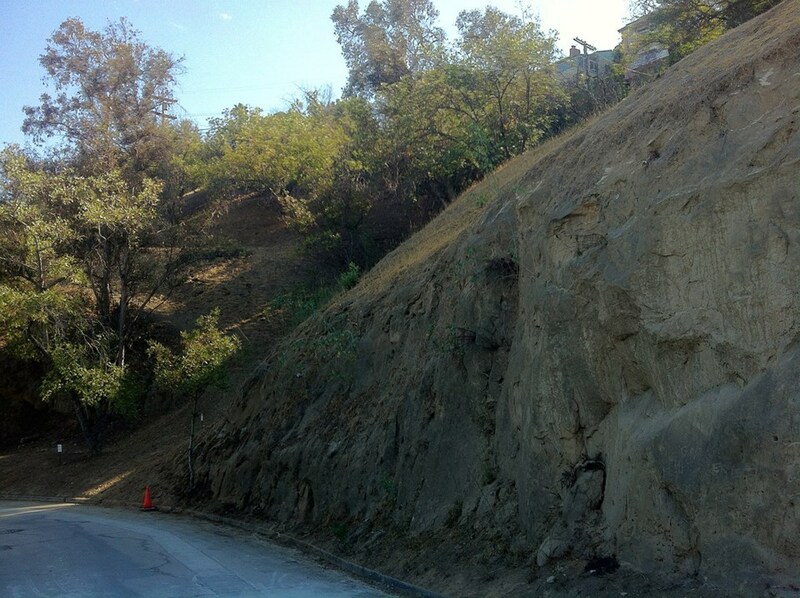 Franklin Hills’ titular hills are part of the Elysian Hills (formerly also referred to as the Felis Hills), a small chain of sandy siltstone landforms with minor imbedded conglomerate that stretch from the eastern terminus of the Santa Monica Mountains (Hollywood Hills) in Griffith Park down to their terminus, Downtown’s Bunker Hill. For many thousands of years the mountains were home to black walnuts, bobcats, California Kingsnakes, Coastal Whiptails, Garter snakes, Gopher snakes, grizzly bears, Mountain Kingsnakes, mountain lions, oaks, steelhead, sycamores, Western fence lizards and other forms of life — but no humans. The ancestors of the Chumash, which evidence suggests have lived in the Los Angeles Basin area for at least the last 13,000 years, were likely the first humans to arrive in the hills. Some 3,500 years ago the Tongva people arrived in the area from the Sonoran Desert whilst the sea-faring Chumash increasingly came to situate themselves primarily along the mainland’s coast and offshore on the Channel Islands. The Tongva remained the dominant power in the Los Angeles Basin for several thousand years — although they settled the southern Channel Islands too. In 1542, whilst exploring on behalf of Spain, Juan Rodríguez Cabrillo claimed all of California for the Empire after having set foot in San Diego Bay, Santa Catalina Island, San Pedro Bay, Santa Monica Bay, and a few other coastal points. Nevertheless, more than two centuries passed before Spain moved to protect their till-then mostly nominal possessions from the possible encroachment from the English and Russians. A plaque attached to a rock marking the northwest corner of the pueblo’s original lands sits in front of the old Monogram Studios (now part of the Church of Scientology). 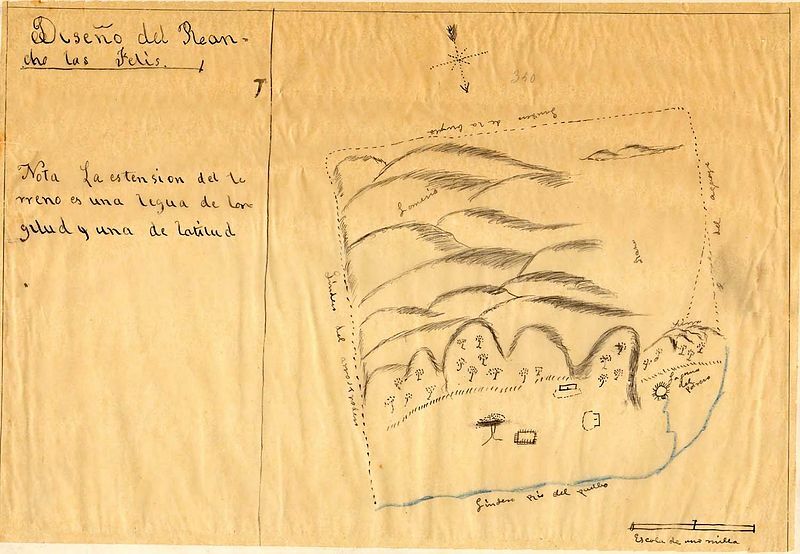 In 1795, just north of Los Angeles, the 26.9 km2 Rancho Los Feliz (aka Rancho Los Felis) was granted to Jose Vicente Feliz, a Sonora-born soldier who’d served during the Anza Expedition of 1776 and who in 1787 had been appointed comisionado of the pueblo of Los Angeles. On 27 September, 1821, after eleven years of fighting, Mexico achieved independence from the Spain. In 1835, Los Angeles was made capital of Mexican California. Following the Siege of Los Angeles by US forces in 1846, Los Angeles changed hands once again the following year. In 1850, two years after the conclusion of the Mexican-American War, Los Angeles became part of the newly-formed County of Los Angeles. The lands of Rancho Los Feliz remained in the hands of the Feliz family until 1863, when Antonio Francisco Coronel (a lawyer from Mexico City and Mayor of Los Angeles from 1853-1854) acquired the land and sold it to a piano-builder/carpenter/land baron/San Franciscan named James Lick. At the time of his death in 1876, Lick was the wealthiest person in California and the majority of his fortune was donated to scientific and social causes. In 1882, the majority of Rancho Los Feliz was sold to Colonel Griffith Jenkins Griffith but the Lick family continued to retain the southwestern portion of the estate until it was subdivided. Los Angeles’s population doubled in the 1870s and nearly quintupled in the 1880s. The first major real estate boom was in 1887 and that year, lots of the “West Portion of the Lick Tract Los Feliz Rancho” were put on sale. More tracts followed, like Nita Heights — but tract names were designed to sell homes, not to foster neighborhood identity, and their names and designations quickly faded from memory. Before then the area had been thought of as Northwest Los Angeles but as the city moved west beginning in 1896, the center of gravity moved and the area (along with Hollywood and Midtown) came to be thought of us Central Los Angeles rather than Northwest. 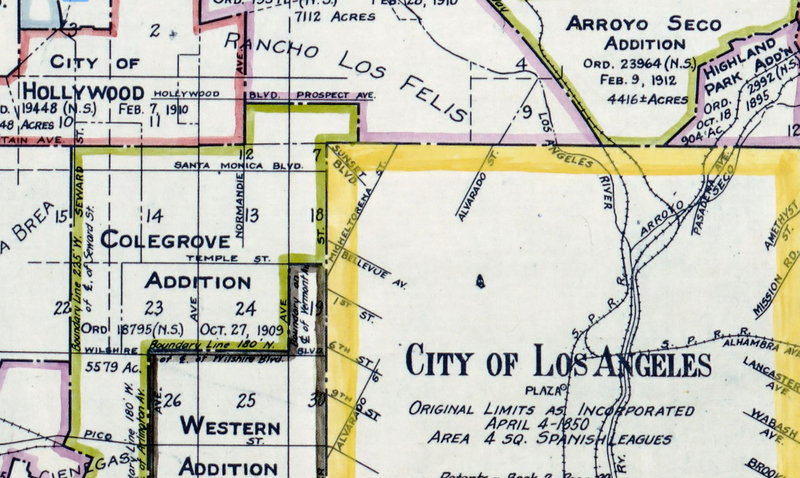 In 1916, Los Angeles’s annexations finally reached the coast of Santa Monica Bay and that same year, the city’s oldest residents’ association, the Los Feliz Improvement Association (LFIA), was organized. Los Angeles’s real estate boom of 1887 went bust in 1888 and but from photos it seems that Franklin Hills remained mostly undeveloped until the 1920s and ’30s (although there is still at least one home in the neighborhood from the 1900s). In 1915, Brooklyn-based film company American Vitagraph constructed a large west coast film studio on Prospect Avenue. In that year alone Vitagraph produced at least 337 films, including classics like In the Latin Quarter, Billy’s Wager, The Smoking Out of Bella Butts, A Mix-Up in Dress Suitcases, O’Garry of the Royal Mounted, The Jarr Family Discovers Harlem, The Jarrs Visit Arcadia, Mr. Jarr Brings Home a Turkey, When Dumbleigh Saw the Joke, The Timid Mr. Tootles, Dimples, the Auto Salesman, and The Making Over of Geoffrey Manning. In 1925, Vitagraph was bought by Warner Bros and in 1927 the Los Feliz facility became the Warner East Hollywood Annex. It was there and that year that Warner Bros filmed portions of the first feature-length motion picture with synchronized dialogue sequences (using the “the Vitaphone process”), The Jazz Singer. 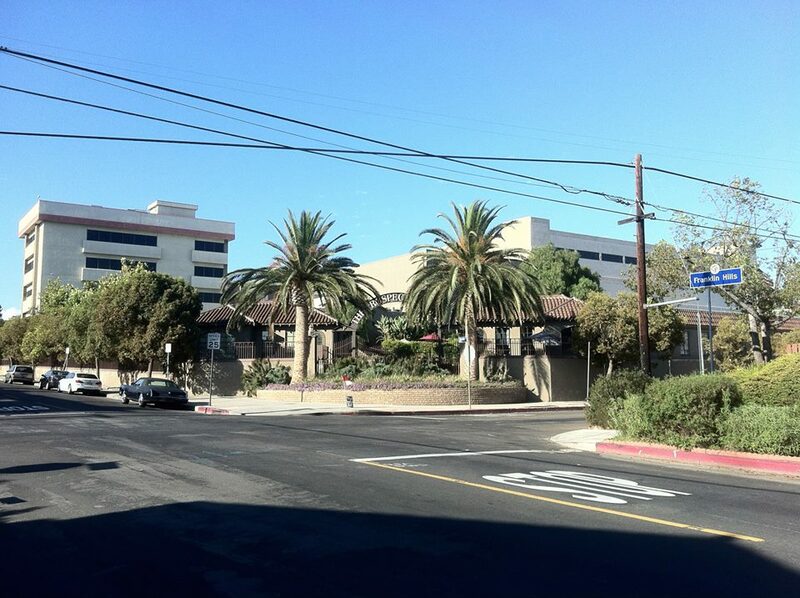 In 1948, the property was sold to ABC and the lot became known as the ABC Television Center and it was there that quality programming like The Dating Game, The Newlywed Game, Let’s Make a Deal, Family Feud, and That’s Incredible! was taped (and most of which my mother explicitly warned me would, if viewed, turn my brain into oatmeal). 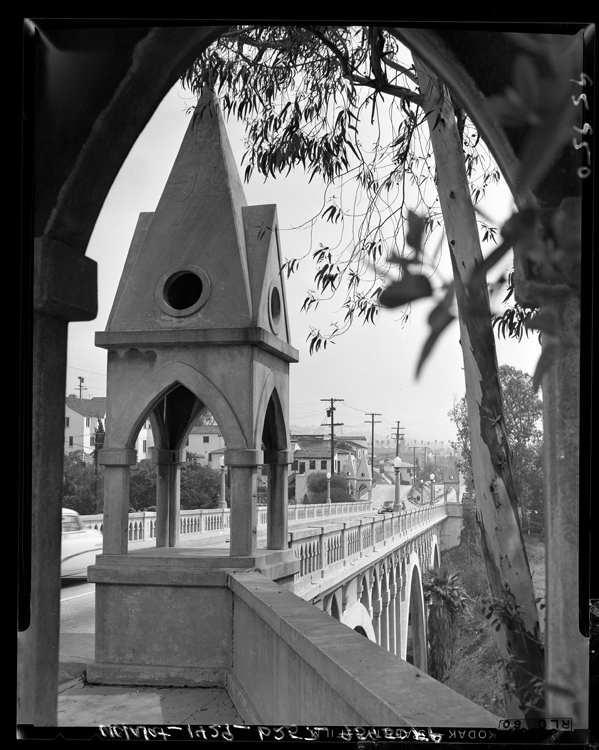 In 1926, construction was completed of the Franklin Avenue Bridge over Sacatela Creek (which had been transformed into an underground storm drain in 1916). 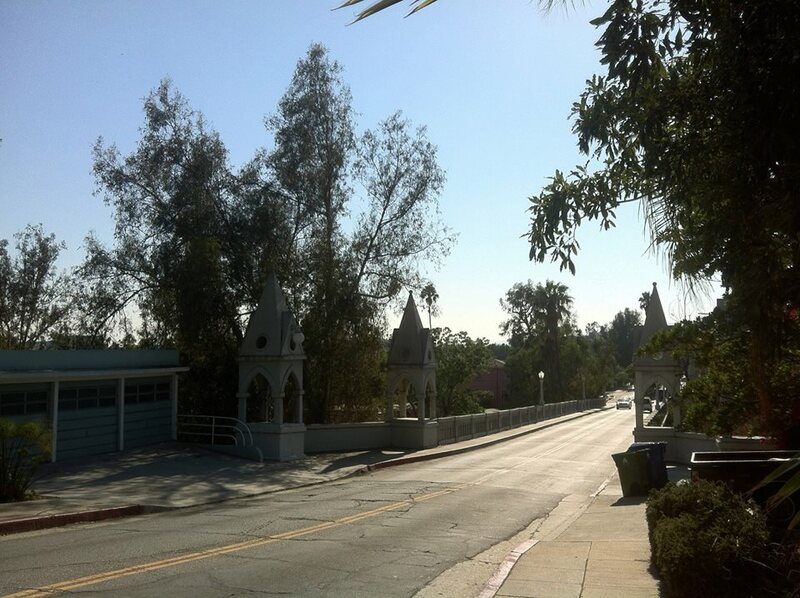 The building of the bridge was promoted as an improvement necessary to aid pedestrian access to the then-also-proposed construction of East Hollywood High School (which as far as I know was never built). 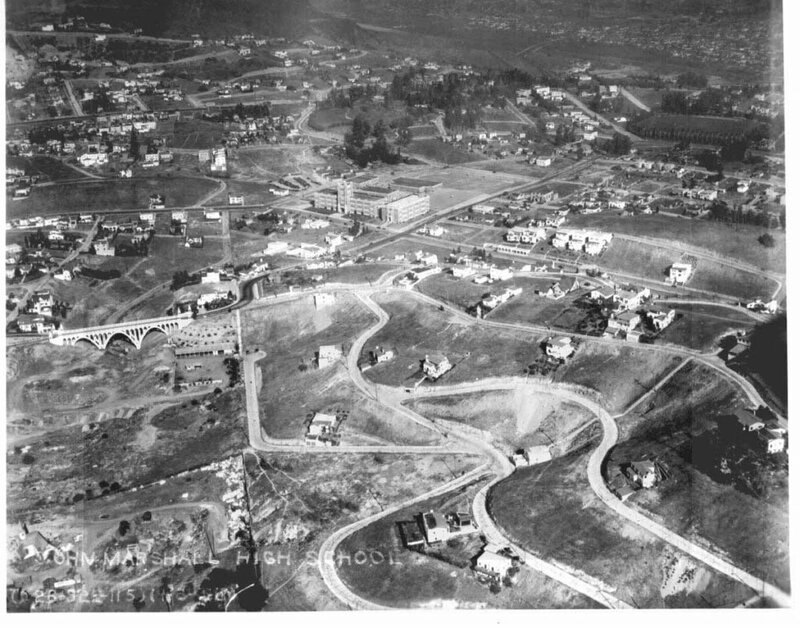 Construction of the expensive bridge was vigorously opposed by the LFIA, who suggested the bridge’s real purpose was to bring financial benefit to local property owners up in the hills and not material benefit for future high schoolers or the public at large. Nevertheless, construction of J.C. Wright’s open-spandrel arch bridge began in 1925 and the Gothic Revival style bridge, though understated, was a striking addition. 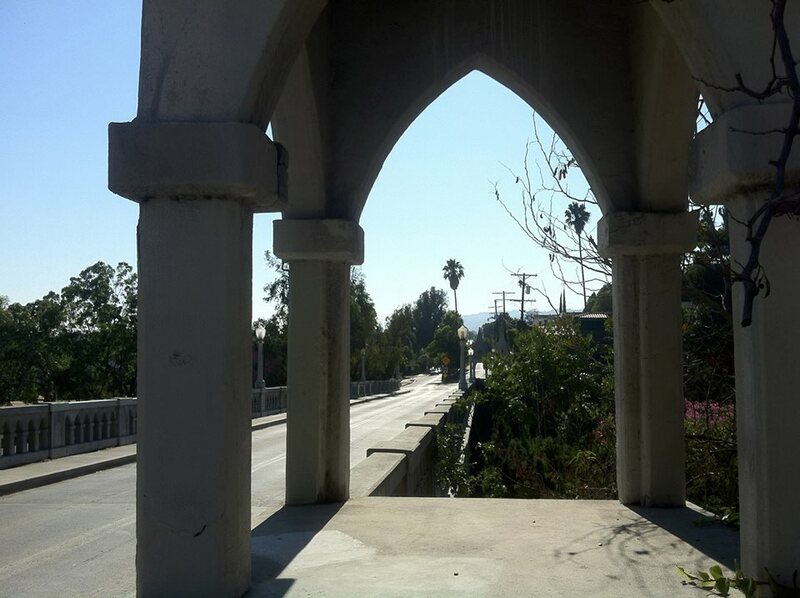 The Franklin Avenue Bridge was referred to both as the Los Feliz Bridge and by the name which it’s mostly-known today, the Shakespeare Bridge, at least as early as 1930 when the Los Angeles Times reported that Maxine Ungeheur (then twenty) and her sister Thelma Ungeheur (then nineteen) were dragged from their car driving over it on Christmas Eve and “ravaged” at gunpoint. In 1998, after concerns were raised over the bridge’s stability following damage sustained in the 1994 Northridge Earthquake, the Shakespeare Bridge was retrofitted and largely rebuilt. For an alternate history of the bridge, watch this episode of Bridges on Bridges. 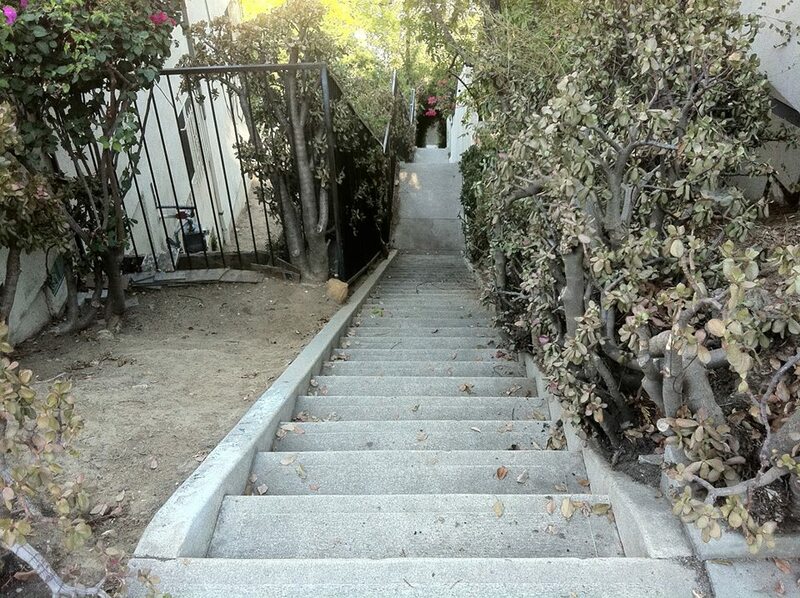 In the 1920s, many of the hillier parts of Los Angeles witnessed the construction of public stairways and stair streets. 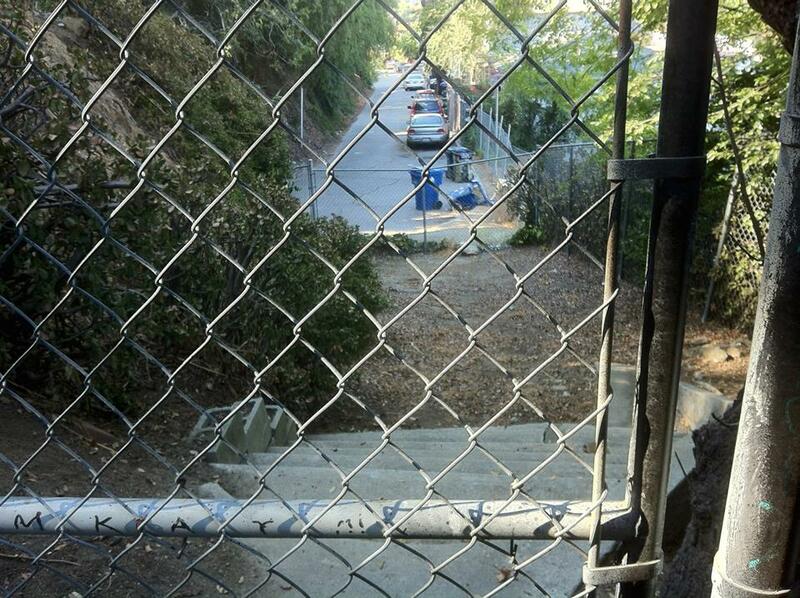 While the claim is often made that the public stairs were built primarily to ease Angelenos’ access to the formerly considerable network of street cars, no trains ever passed through Franklin Hills. 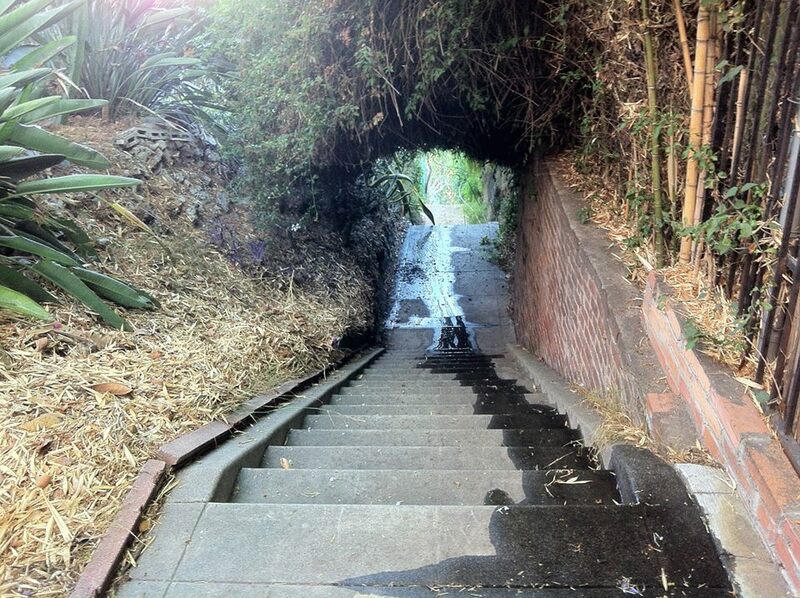 Yet there, perhaps more than in any other neighborhood, is the largest concentration of public stairways in the city. Informal names (as far as I know) include Cumberland Avenue Stairway, Udell Major Stairway, Clayton Avenue Stairway, and Scotland Stairway. Stairs with their own street signs (and thus I reckon official status) include Radio Walk and Prospect Walk — the “shotgun” style of the latter’s sign means that it was installed sometime between 1946 and 1962. Although the stairs were surely used by bus rather than train riders (making their way to any of several stops of the Los Angeles Motor Coach Company‘s 87 line) the truth might be too shocking for the car-dependent — that is that even in the decade when car ownership rates in Los Angeles surpassed those of all other cities, plenty of people opted to walk up and down stairs not for exercise but because it was the option that made the most sense. Nowadays the neighborhood is served by Metro’s 175 line but it seems to me that around the 2000s all but the mobility scooter set seem to have discovered the joy of walking. Of course there have always been people who’ve walked but it was in the first decade of the new millennium that time people like Neil Hopper, Robert Inman, Dan Koeppel, and Charles Fleming began documenting and gaining attention for their curious habit of walking for pleasure — often up and down stairs. Following their lead, a legion of public stairway enthusiasts/bloggers/exercisers have systematically and almost compulsively sought to follow in the footsteps of their heroes, counting with a trainspotters attention to the mundane, the number of stairs along the way. I myself have long been a fan of alleys, pedestrian walkways, and cuts — but despite my considerable time walking on stairways I still rarely encounter others. In Franklin Hills I followed a man up a stair street who, from the sound on the other side of the gate, was heading to a mid-day party. I also passed by a group of boys vaping weed. Thomas Starr King Junior High School was founded in 1926 with an address on Myra Avenue (a street built to cover Sacatela Creek which now flows about ten meters below it). At some point its address was changed to Hyperion Avenue. 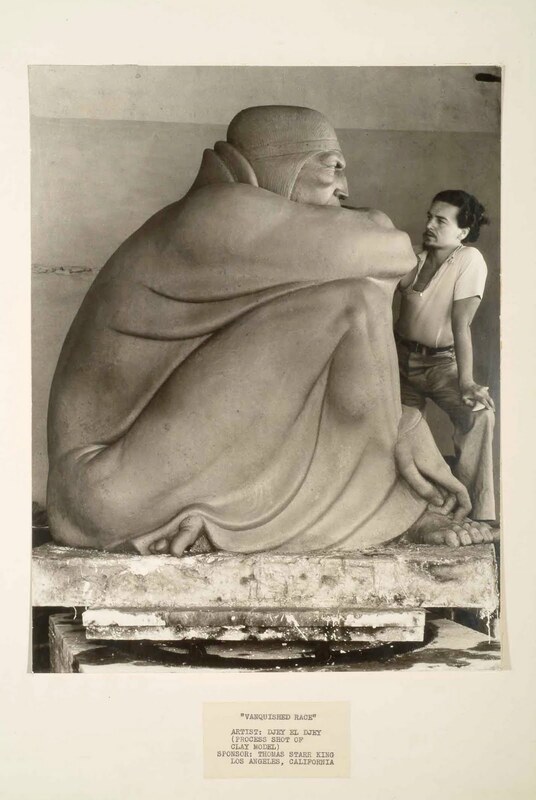 On the campus is sculptor Djey “El Djey” Owens’s piece, The Vanquished Race, commissioned by the WPA’s Fine Arts Program and installed at the school in 1936. (I was informed that it was colloquially known to King students, at least formerly, as “Chief Itchy Toe”). In 1995, Thomas Starr King Junior High it was reconfigured to become a middle school. Although there are homes in Franklin Hills dating back at least to the 1900s, many more were built in the 1920s, ‘30s, ‘40s, ‘60s, and ‘80s and thus reflect a variety of architectural styles — often located side by side. 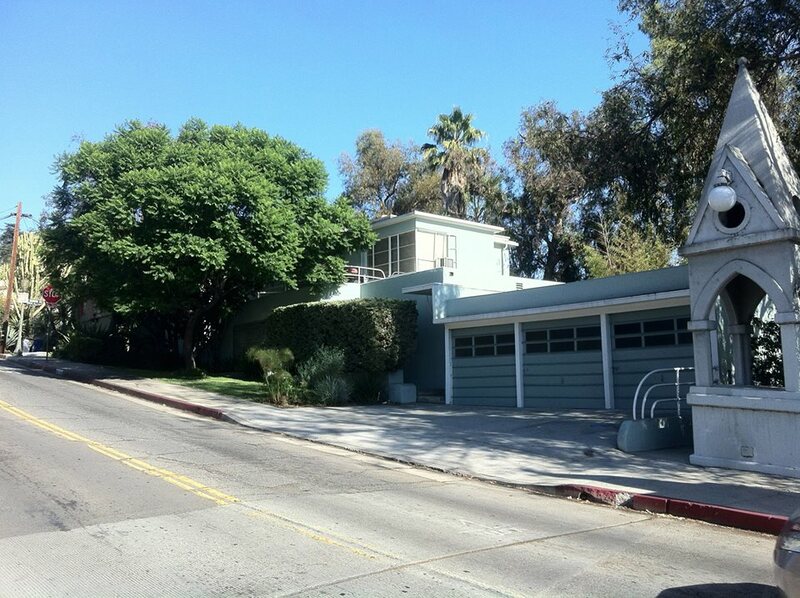 In the 1920s, two twin homes near the corner of Lyric Avenue and St. George Street were owned by brothers Roy and Walt Disney. Disney Bros. 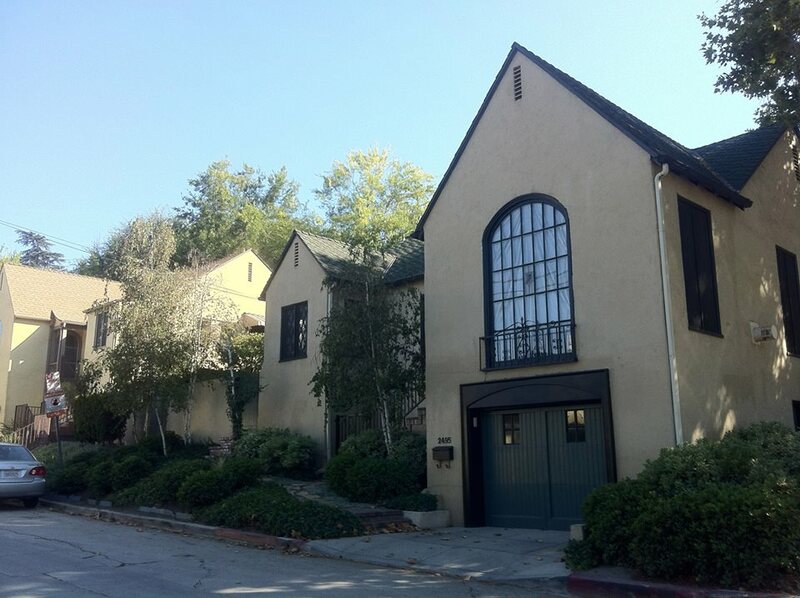 Cartoon Studio was founded nearby in Los Feliz at 4651 Kingswell Avenue. In 1926, when the Disney Brothers were both still living in their Lyric Avenue homes, they opened Walt Disney Hyperion Studios, also chosen for being within walking distance. 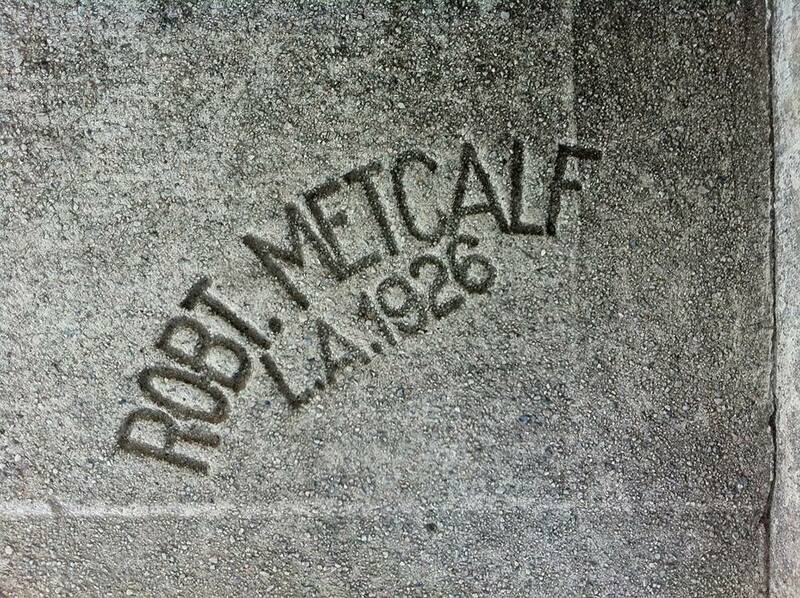 Walt remained in his Franklin Hills home next to Roy’s until 1933, when he and his expanding family moved up the hill (still in Los Feliz) to his “castle” on Woking Way. 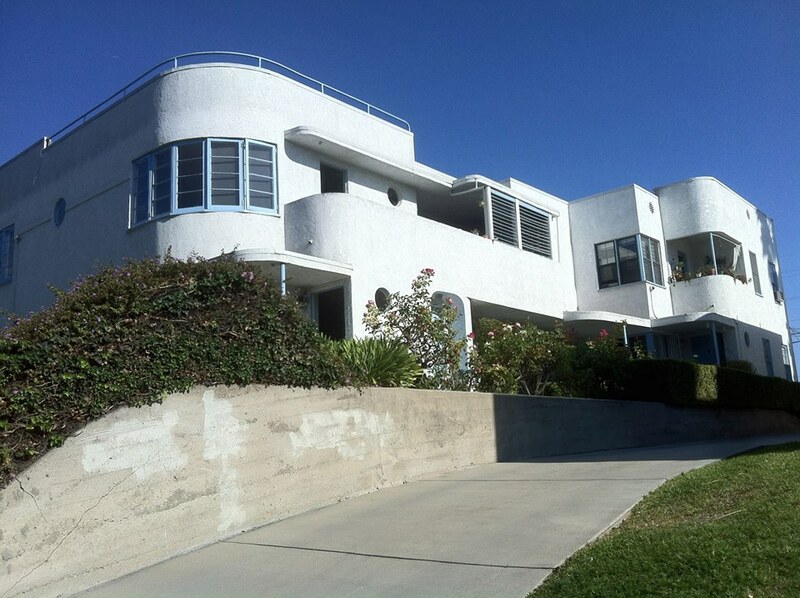 I’m a fan of almost all styles of architecture (with the exceptions of a good deal of Post-Modernism, Deconstructivism, Sea Ranch, and Frank Gehry’s) but I particularly enjoy Streamline Moderne, a style which emerged in the 1930s and the strange, aerodynamic nautical elegance of which is reflected in the several Franklin Hills residences. In 1960, celebrated architect John Lautner was commissioned by wealthy industrialist Kenneth Reiner to build the Midtown School. 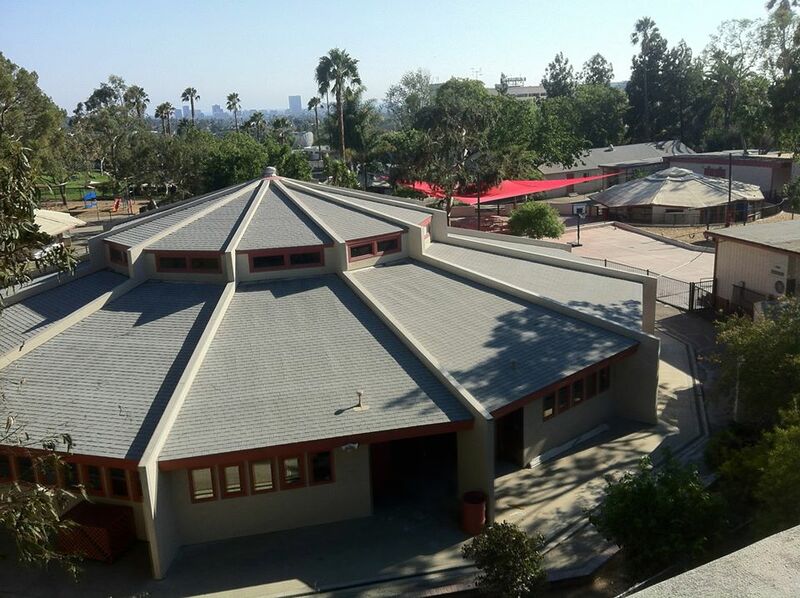 The Midtown School was completed in 1961 and is the only campus designed by Lautner. 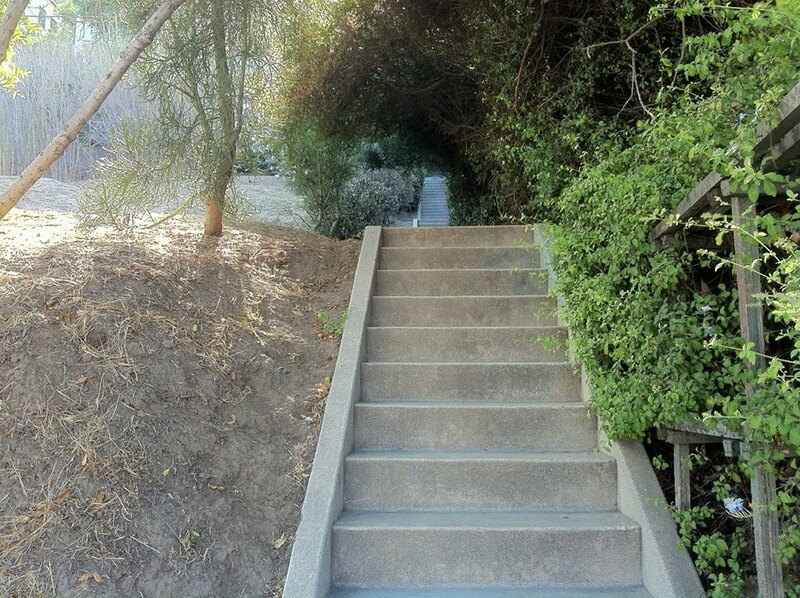 Two years later construction was completed of Lautner’s Reiner-Burchill Residence (Silvertop) in Silver Lake. 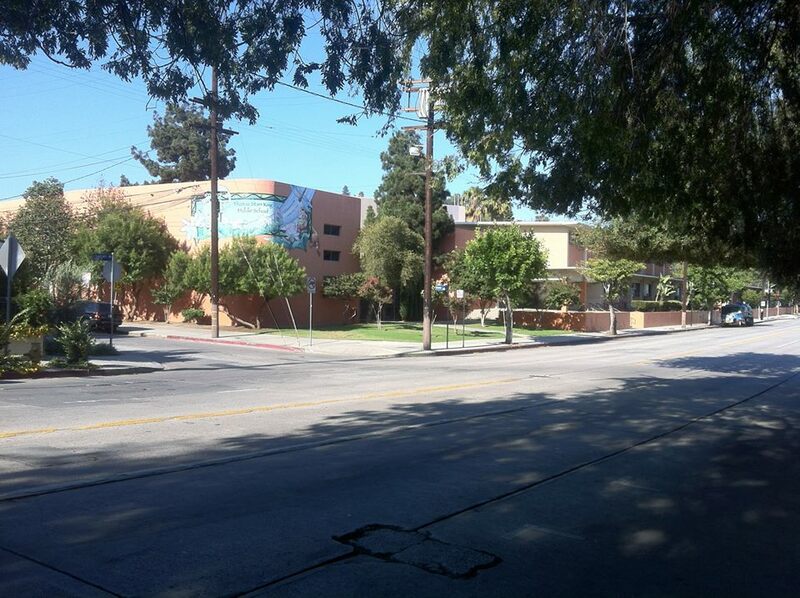 The school later became the Los Feliz Hills School, which may’ve had something to do with the secession of Franklin Hills and around 1989 became a campus of Lycée International de Los Angeles. Histories of ages passed with Franklin Hills existing as part of Los Feliz until 1988, when some homeowners organized the Franklin Hills Residents Association, perhaps motivated by their opposition to the construction of some townhouses on land sold by the Los Feliz Hills School. As early as 1991 the FHRA were publishing their own newsletter, The Overview, taglined “A View from the Bridge,” which covered news and views not just of Franklin Hills but Los Feliz and Silver Lake as well. I’m not sure if it’s still in publication — the last issue that I found online was from 2004. In 2002, the Greater Griffith Park Neighborhood Council (GGPNC) was certified to represent Griffith Park, Los Feliz, and Franklin Hills. 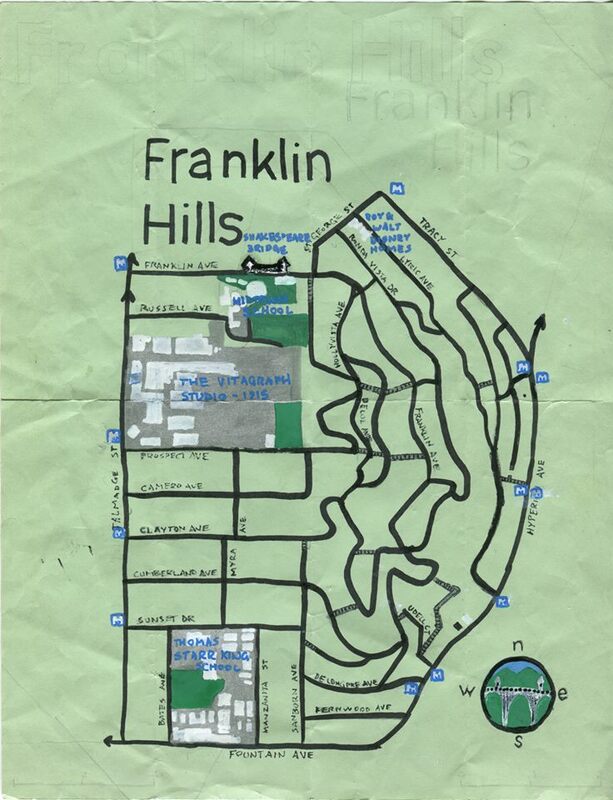 In 2008 the Los Feliz Improvement Association covered their territory to include Franklin Hills. 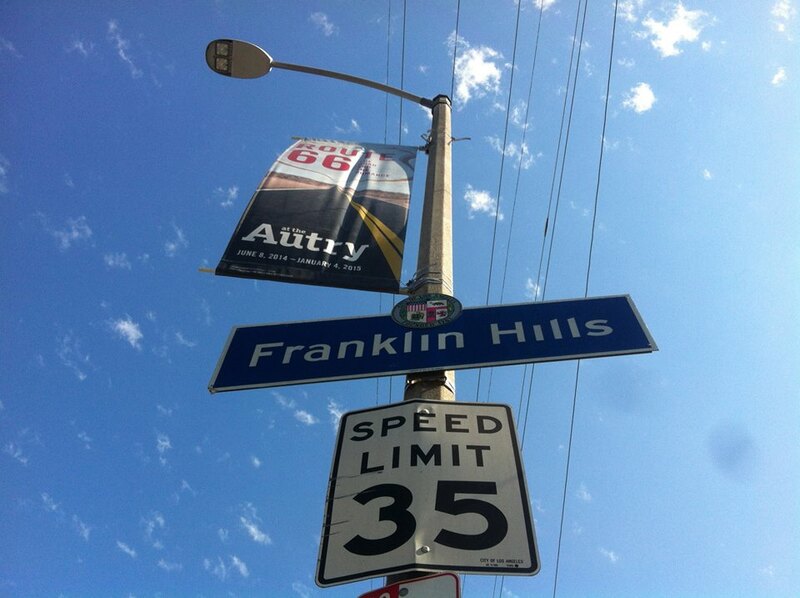 However, as far as I know, a distinct Franklin Hills identity remains fairly intact… or does it? There aren’t many restaurants in Franklin Hills and those that are generally claim to be in either Los Feliz or, more often, Silver Lake. One such restaurant is Tomato Pie Pizza Joint. The first location opened in the Melrose District and in 2008 they opened their “Silver Lake” location in Los Feliz/Franklin Hills. It’s perhaps best not to visit their website as the writing is insufferably smug and dismissive of other great Los Angeles pizza places (like Bollini’s Pizzeria Napolitana, Pizza Buona, and Village Pizzeria) but Tomato Pie does make great pizza and I highly recommend grabbing a slice. I wish that I could love Ô Bánh Mì, because there are no great Vietnamese restaurants in the area (although Echo Park’s Kien Giang Bakery, who advertise their location as being “about 30 miles north of Little Saigon” is to my liking). Ô Bánh Mì is located in the former location of Vietnamese Soy Cafe, which is what drew me there only to find it was a different Vietnamese Restaurant… and one only open for three hours of each day! I’ve only eaten there once but as someone who prefers salty thịt chay to lemongrass tofu, expects their sandwich to have pickled carrots and daikon (Ô Bánh Mì’s don’t), and is used to paying $1.50 for a bánh mì in Rosemead or Little Saigon, I wasn’t disappointed but neither was I motivated to return. Franklin Hills is also home to the King’s Roost, an “urban homesteading” store for folks who want to make their own soap, brew their own beer, raise chickens in their yard and other undertakings that no doubt endear one to one’s neighbors. 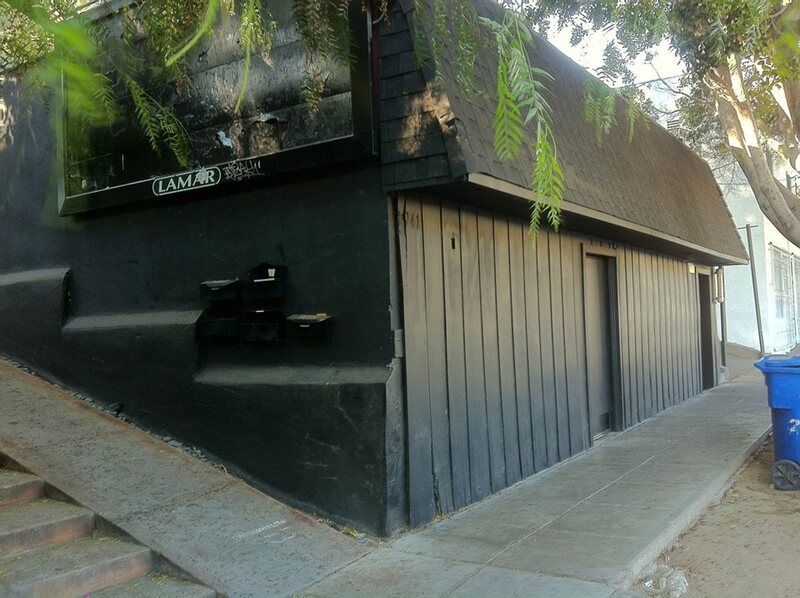 In the 1990s, a tiny, windowless building was home to Cuffs, one of many now-closed gay bars in the area (also including Detour, Le Bar, Le Barcito, Flamingo, Jolie’s, MJ’s, New Faces, and The Other Side, and whatever MJ’s used to be) but the only gay bar which I was frankly too scared to ever go into, resembling in my mind something out of William Friedkin’s Cruising. Since its closing, tales recounted to me by friends have reassured me that Cuffs was, in fact, not for me. Now the old Cuffs space is Hyperion Tavern, which I did go to once and didn’t leave much of an impression on me. However, if memory serves me correctly (and it might not), they only served beer in bottles (in other words, nothing on tap) which renders it useless — especially when Lee’s Liquor Mart does the same for much less and without pretense. On the Los Feliz side of Tracy Street is Baller Hardware, a neighborhood institution since 1959. On the Franklin Hills side of the street is Baller Art Ware, which I suspect is somehow connected. It’s my most frequently-shopped art store, where I buy the oil paint that I use to make maps as Pendersleigh & Cartography. In 2013, celebrity artist Shepard Fairey and his team installed a new mural which I reckon from its text is called Make Art, Not War — which strikes me as good message albeit one that is a bit ironic coming from an artist best known for propagandizing our conservative, hawkish, drone-loving warmonger president. Down the street is another sort of art store, Baltic Crossroads, established in 1992 by Alfreds Stinkuls, Inguna Galvina, and Vladas Ruksa to support local artists of Baltic and Nordic heritage. I have a hazy memory of visiting them at their old location, which I remember being closer to the old Northwest corner of the city, but I guess it moved to its current location in 2005. Similarly, and although I’ve passed it hundreds of times, I never noticed the shop (and gallery?) of Los Angeles-born artist Nicholas Gagliarducci, an artist who was a prominent figure in the 1990s Melrose scene. Since finding fame his have clients included Camel Cigarettes, Columbia Pictures, and Princess Cruises. So there you have it, get out of your car and dare to go where not even Google Maps will take you. As always, corrections and additions are welcome and see you on the streets. In other words, the Northwest corner of the pueblo was located near East Hollywood’s Akbar and thus not far from Franklin Hills. As far as I know, neither this corner nor any of the others are commemorated by plaques (hint hint). 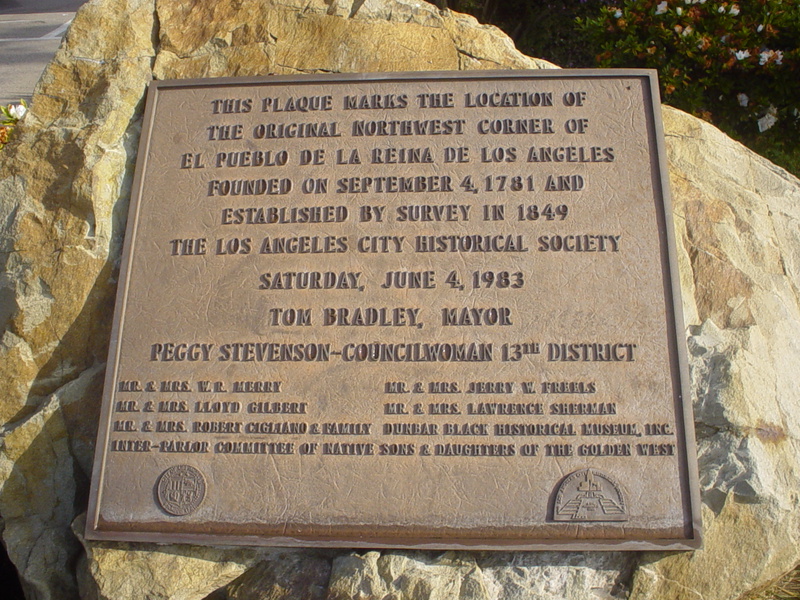 A plaque was placed at the northwestern point of the original settlement in 1981 in commemoration of the 200th anniversary of the original pueblo. 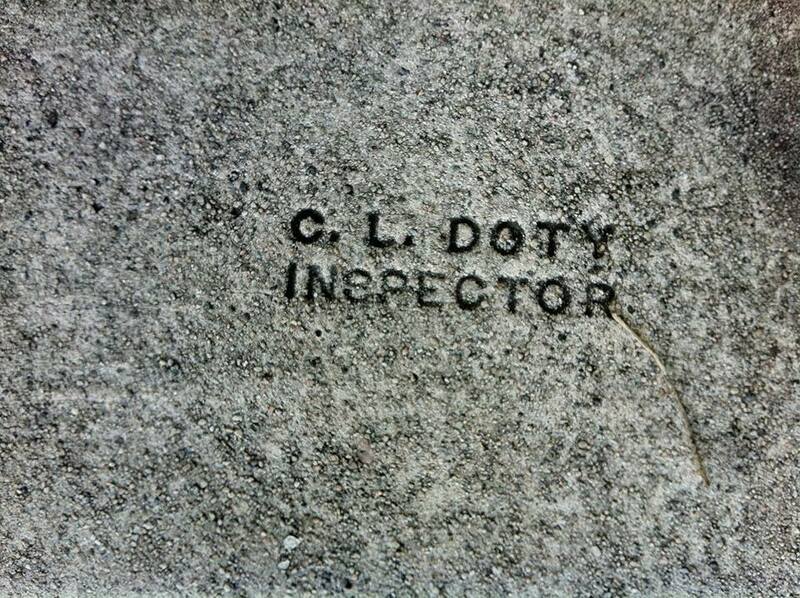 The marker is placed at the entrance of the old KCET-TV studios on Sunset Boulevard. Ah, I’ve seen that plaque and even read it entering the old studio when it was owned by KCET but for some reason I thought that it had something to do with that building being an historic movie studio. Thanks for setting the record straight!